Summer is a time for friends, sun, and fun. But summer is also a time for sunburns, which can lead to skin problems now and in the future. Keep your skin safe from the dazzling sun to give your skin a chance at optimum summer health! Obviously, sunscreen is a must, but there are other techniques and tricks you can incorporate into your daily routine to get the best skin care throughout the summer. If you want the best skin care during the summer, it is best to get the best sunscreen. Dermatologist recommended sunscreen can help your skin get the best protection, we recommend it for a reason. At Azeal Dermatology Institute, we offer different sunscreens on our online store that we believe work best. Find a sunscreen that will work for your skin, or set up a skincare consultation and get a recommendation for which sunscreen you should get based on your skin type. Applying sunscreen may be the most important thing you can do to take care of your skin during the summer, and honestly, all year long. Many people use sunscreen without knowing the properties, ingredients, or what the different aspects mean or why they are important. Sunscreen has developed over the years—you can now find sunscreen in lotion, cream, spray, sticks, gels, and ointment form now, allowing for you to find the best fit for your needs. But there are other aspects you need to consider when making the tough sunscreen decision. SPF stands for Sun Protection Factor. The SPF number that you find on a bottle of sunscreen is measuring the protection from the UVB rays—the rays that are responsible for causing sunburns and contributing to skin cancer. You are not protected from UVA rays due to sunscreens SPF. These rays are also harmful, however. It is recommended to use sunscreens with an SPF of at least 30. Although SPFs like 50 or 75 seem like they would work a lot better and offer more protection, they are not a whole lot different than lower SPFs. Higher SPFs will block out more of the UVB rays, but no sunscreen will block out 100 percent of these rays. SPF 15 blocks out about 93% of the UVB rays, meaning that about seven out of 100 photons make it through. SPF 30 will block out about 97 percent of UVB rays, allowing only three out of 100 photons through. Broad spectrum is just as important as SPF. Broad spectrum is what protects you from the UVA rays mentions above. UVA rays cause skin aging, like wrinkles and sunspots, as well as contribute to skin cancer. UVA rays are present all year long, which is why wearing sunscreen all 365 days is important! When sunscreen shopping, you will want to be sure that the label says “Broad Spectrum”. When it comes to UVA protection, SPF comes into play. Higher SPF should give you better protection against the UVA rays. So while UVB protection does not change a drastic amount with the SPF level, UVA does. UVA rays account for approximately 95% of UV radiation. And although these rays do not cause sunburns, they are the leading cause of skin cancer, meaning that they need to be protected against. Zinc oxide is an active ingredient in most of the sunscreens that we offer through our online store. Zinc oxide is simple oxidized zinc, a metallic element found in nature. Zinc is used to help the body in many ways—it is an important aspect of protein synthesis, metabolic process, and enzyme creation. Zinc also helps improve the immune system, digestive tract, the brain, and skin, which brings us to its use in sunscreen. Zinc oxide is what provides sunscreen with its broad spectrum characteristic. This natural element helps protect skin against sunburns and other damage. Zinc oxide offers a “physical” sunscreen rather than a “chemical”. Chemical sunscreen uses different ingredients and often does not offer the broad spectrum protection. Based on the amount of zinc oxide in the sunscreen, the strength and reliability of the products ability to prevent burns will change. The percentage of zinc oxide, generally between 25 to 30 percent, used in the product will be specified by SPF level. Zinc oxide is used in more natural sunscreens, which are generally viewed to be safer than chemical sunscreens. In many sunscreens, zinc oxide tends to be the only active ingredient, but some include one or two more active ingredients. Now that we have gone over some of the main components of sunscreen, be sure to check out our sunscreen products, and find one that works for you! But sometimes, sunscreen application is forgotten in your routine, leaving you with a sunburn and regret. Sunburns do happen. And although you may not want to admit to not wearing sunscreen, that is generally the reason why the sun affects your skin. First thing you need to do to treat your burn is to start treating as soon as possible. If you notice your burn while you are still outside, get out of the sun. Once inside, follow these steps to help lessen the pain from your sunburn. Step 1: Use a cold and damp towel. Taking a cold shower or a bath also helps. This will remove some of the heat from your skin, allowing you to be in less pain. Hold a cold, damp towel on your burnt skin for about 10 to 15 minutes, doing this daily can help remove heat and relieve pain. After a cold shower or bath, pat yourself dry while leaving some water on your skin and using moisturizer to trap the water in your skin. Doing so will help you with the dryness that comes with a sunburn. Step 2: Use aloe vera! Aloes vera is a great way to soothe pain from a sunburn and rid your skin of the excess heat. You can buy aloe vera alone or a lotion with aloe vera in it. Soy can also help soothe and remove heat. Make sure any lotions you are using do not contain petroleum, benzocaine, or lidocaine, these will cause more harm than good. Step 3: Don’t pick the blisters. As gross and uncomfortable as the blisters on your skin may be, do not pop or pick at them. This will make your sunburn worse and could cause infection. They may pop by themselves, but you still should not pick at them, let them heal on their own. Step 4: Watch for signs of illness. If sunburns are really bad, they can cause sun poisoning or illness. If you start feeling weak, dizzy, or ill, seeing a doctor might be necessary. If the pain is the only thing bothering you, you can take an ibuprofen, which will help with the pain and reduce swelling burn. Step 5: Drink a lot of water! Drinking a lot of water in the summer is a good idea even when a sunburn isn’t present. Staying hydrated can help you look and feel better. But when it comes to a sunburn, you can get dehydrated more easily, drinking more water than usual when you are suffering a sunburn can help you feel better. Step 6: Don’t make the same mistake twice! After you have healed from your sunburn, make sure you learn your lesson! Don’t go out in the sun without applying sunscreen and bringing some with you to reapply later in the day! The more you get sunburns the quicker your skin will age and the chance of skin cancer will rise. So apply some sunscreen and enjoy the sun without having to worry! Now that you know the important parts of your sunscreen and how to make a good product choice, be sure that sunscreen application is in your daily routine. Protect yourself from UVA and UVB rays with broad-spectrum sunscreen and keep your skin looking healthy and youthful! At Azeal Dermatology Institute, we offer broad-spectrum sunscreens that we believe work best. Find a sunscreen that is right for you, or schedule a skin biopsy and we can help you determine which sunscreen is best for your skin! 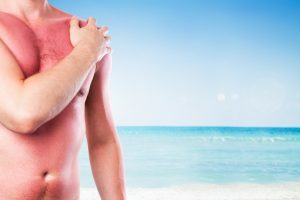 If you have suffered from one too many sunburns, give us a call and we can check your skin for any signs of skin cancer and help plan a treatment for you.